The Al-Khazam family on the boat from Egypt to Italy, under a new moon. Drawing by Laya Al-Khazam. 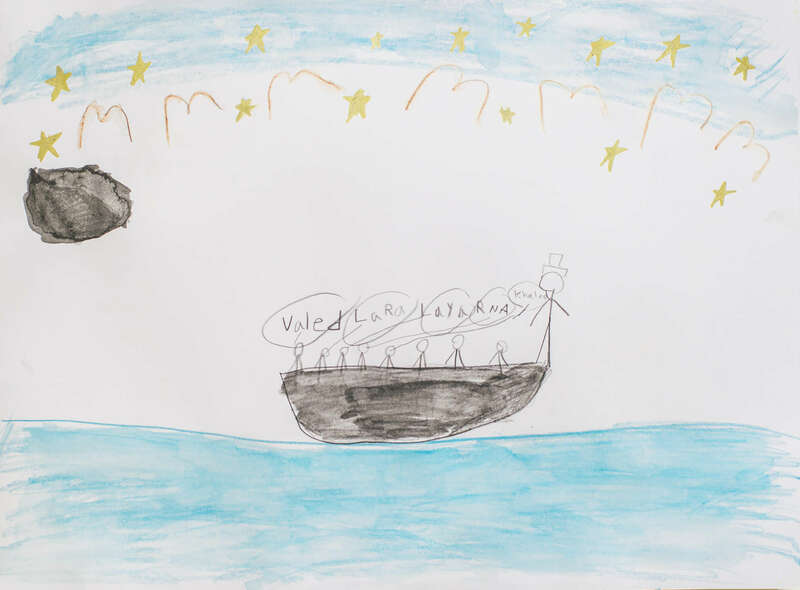 On a week when the weather was good and the seas were calm, Laya’s parents decided it was the safest time to cross the Mediterranean to Europe. It was December of 2014 and the beginning of winter. Laya’s family left from the shores of Alexandria, Egypt under the cover of a new moon, when the sky was clear and dark, so that others wouldn’t see them. They were scared because they knew that the journey was dangerous. They traveled on the sea for a week. There was only one bathroom for 400 people. At times, Laya wanted to get up and run around. But the boat was crowded, and people were not in a playful mood. So instead, Laya sat quietly. She looked up at the sky and dreamed about reaching Sweden. By the seventh and final day of the journey, there was no food or water left. Lots of children cried and people got sick. But Khaled and Rana--Laya’s parents--were surprised. None of their children—eight-year-old Laya, ten-year-old Waled or even four-year-old Lara—cried or complained the entire week they were on the boat. Finally, after what felt like forever, the Al-Khazam’s boat reached the shores of Italy. They finally had made it to Europe. When all of their family was off the boat, they stood on the beach and hugged for a long time.